Y'all know I like a good cup of coffee. Pretty much any time, anywhere, but mainly in the mornings, sometimes a refresher in the afternoon and when I'm extra daring, coffee after 7pm. Since it's 827 degrees outside around here during the summer, iced coffee is even better. I would occasionally treat myself to a Starbucks iced joe or even a McD's, plain just cream, but I still worried about the mystery calories and evil sugars and then there's the whole cost thing and the whole driving thing in order to indulge. I tried making an iced coffee with my Keurig and the whole piping hot beverage poured immediately over ice only resulted in extremely watered down coffee-tea (though I have heard tell of a K-cup made especially for iced coffee) which was disappointing at best. I decided I would just have to sweat if I drank coffee in the afternoon. Then I read about Pioneer Woman's version of iced coffee. And I pondered a while. Then a bit later I read about Julie's misadventures in search of perfect iced coffee. And pondered a while longer, but this time with a little fear. 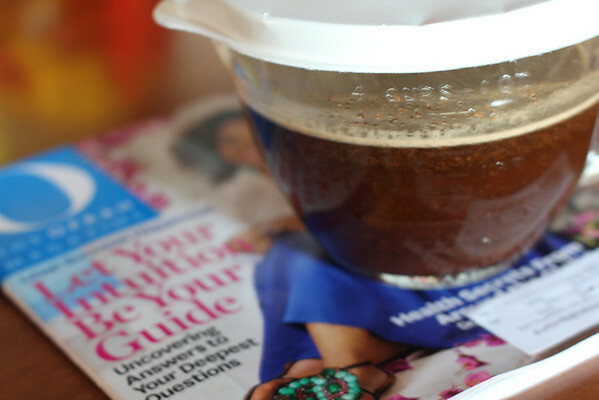 I stumbled across a 2.5 inch blurb in the back of last month's O magazine about making iced coffee and was not immediately intimidated by the process or the supplies required (I'm much more likely to actually do something if I already have suitable supplies). And I thought it was definitely worth sharing with y'all on the off chance y'all are like me (lazy) and intimidated by the thought of making two gallons of coffee concentrate (and don't have containers that large just hanging around the house and don't want to go shopping) (again, lazy much?) and are afraid of wrangling said two gallons of coffee to strain it and constantly on edge that it will spill all over your kitchen at any moment. 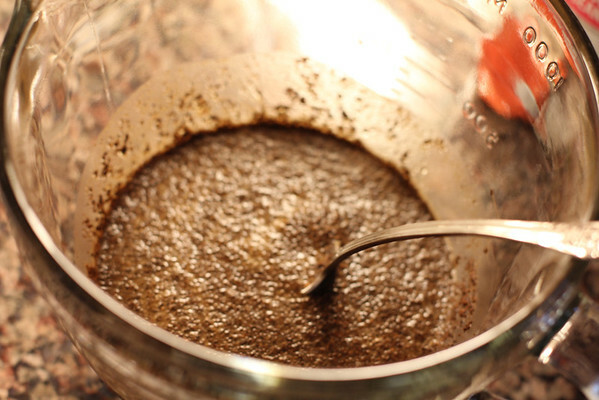 Take 1/2 cup ground coffee. Yes, it looks like sludge. But a it's a delicious sludge. Add two more cups of water (not pictured, sorry, use your finely honed imagination). Cover and let sit for twelve hours. Iced coffee can not be rushed. Strain coffee mixture into an appropriate storage container of your choice. I chose my yellow Fiesta pitcher because it makes me happy. 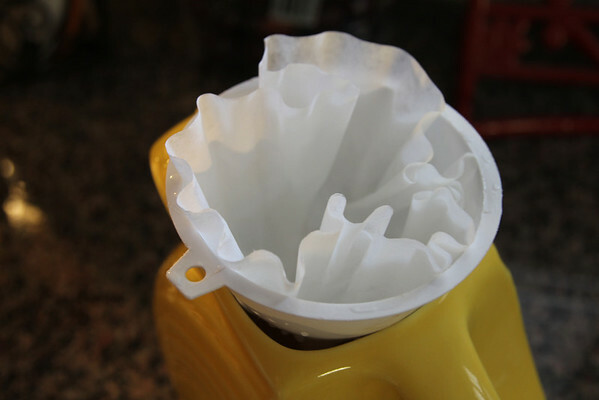 This takes a little while and shouldn't be rushed because then your coffee filter might break. Not that I'd know about that. Ahem. Right before this photo was taken I had a moment of terror after all my careful planning and execution. As I was taking the lid off of the coffee sludge container the bowl tipped. I'm having post traumatic flashbacks as I type this. Coffee sludge spilled all over the counter. And all over my camera which was sitting right next to the bowl. Even though it wasn't two gallons (praise and glory), it was still spreading everywhere. Fast. Time slowed down and I think I had an out of body experience as I stared at my beloved camera sitting in a puddle of coffee. I rushed to its rescue and quickly yet lovingly dried it off and knock on wood everything seems A-OK. Except I still smell coffee when I take photos, which for me is not a terrible thing. 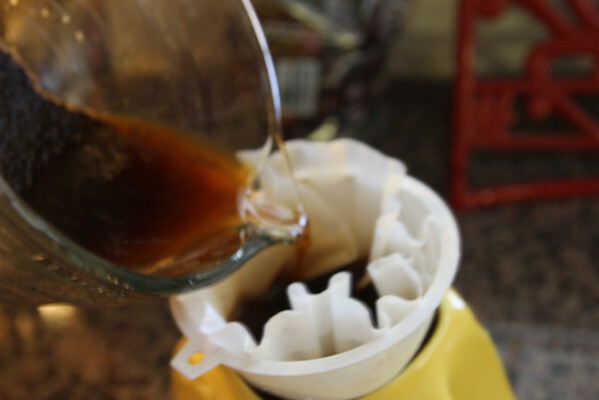 Carefully pour your coffee sludge through a strainer & cheesecloth, if you have those types of things, or rig up a funnel and coffee filters if you don't. Then y'all are ready for the best part, the part where you get to sample the fruit of your labor (and camera endangerment). Coffee, even iced coffee, is a personal thing. Everybody has their own favorite ways to doctor it up from milk and sugar to sweetened condensed milk to fancy schmancy syrups. Hey, power to the people. Believe it or not, I am a coffee minimalist. I added ice, a bit of water (remember this is a coffee concentrate) coffee and then a splash of half and half. Because straws make life happier. And bendy straws are even happier. I'm now on my third batch (since it makes less than PW's version you do have to make it more often) but I have tweaked things a bit and used 1 cup ground coffee, 1 cup water, followed by 4-6 cups water in order to have it last longer. What do you put in yours to doctor it up? 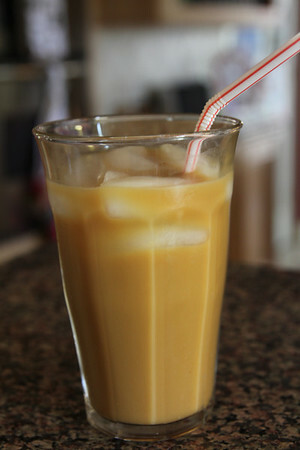 Have you made your own iced coffee at home? Any tips? I will so be trying this! I love me some ice coffee..in the afternoon ..and share the same reasons for not wanting to spend/drive to various locations for the liquid gold. Another question for you..your yellow purse..do you remember the style name and color. I have been thinking about it...too often...even watched QVC who was featuring his bags...let me know if you remember..thanks! First of all, I loved this post - you crack me up. Second, I'm not a big coffee drinker, but ever since I had my first taste of a mocha iced coffee at Starbucks I crave them all the time. I am not a coffee drinker, but I am OBSESSED with Starbucks Passion iced tea. Even though it's one of the cheapest things on the menu, when you're buying it practically every day it becomes an expensive habit. I tried making it myself with the individual tea bags, but it just didn't taste the same. So I asked my barista how they made it and discovered they use filter bags, which I learned you can order off of their (or Amazon's) website. So I did, and until we moved, I always kept a pitcher full of tea concentrate at the ready. (And I even bought one of the reuseable starbucks cups so that I feel legit when I'm drinking it.) I've missed having them every day. I can't wait to be reunited with my filter bags! 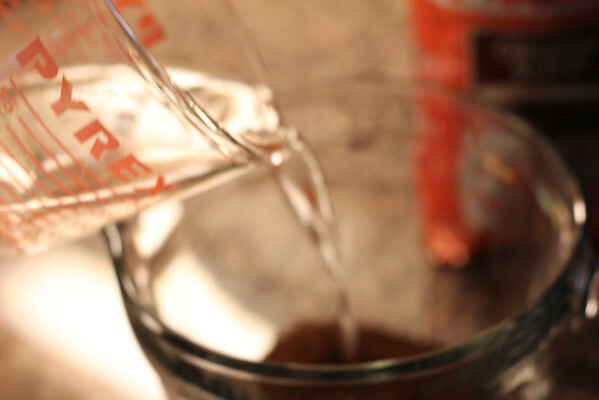 I have about 10 different flavors of sugar free Torani syrup that I use in mine at home. I only do decaf now though. I'm also liking iced chai now that it's so hot outside but even though I used the same brand of concentrate at Starbucks (Tazo) mine never is as good! There must be something about paying $5.13 for a grande drink that MAKES it good! Holly, you seriously make me laugh. And for that I am grateful. 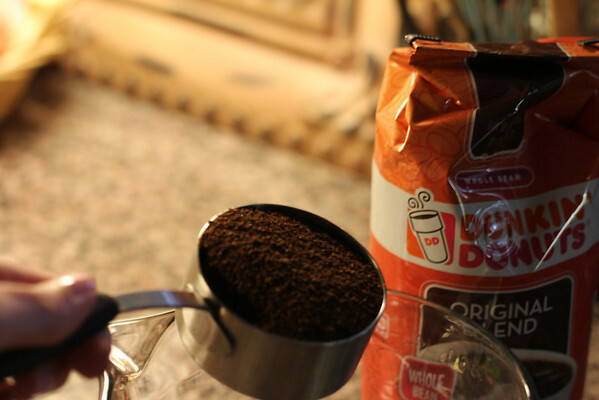 I am also grateful that you've shown me the way to make iced coffee. I can't stand cold coffee! Don't do coffee ice cream or frappucinos or anything. I like my coffee hot or not at all. Hahaha :) cute post. I LOVE my Fiestaware pitcher and I never use it, thanks for the idea!! This seems like a very high effort treat!